Patricia Tortora, first year graduate student, was selected for the 2015 Behavioral Health Leadership Development Project. 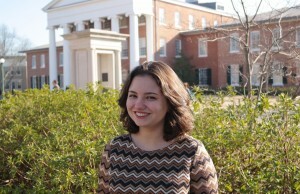 Patricia Tortora, a student in the master of social work program at the University of Mississippi’s Social Work department, was one of 22 individuals selected for the 2015 Behavioral Health Leadership Development Program. A component of the Substance Abuse and Mental Health Services Administration‘s Project LIFT (Leadership Initiatives for Tomorrow), the program is both a national and competitive project that recruits young leaders in behavioral health. Tortora is a first year graduate student with a clinical concentration in behavioral and mental health. She holds a bachelor’s degree in social work from UM and is currently a graduate assistant for the Child Welfare Training Academy. “I am honored to represent University of Mississippi’s social work department in this national seven month project,” said Tortora. As a part of the program, she will be attending an immersion seminar in Bethesda, Maryland and participating in monthly webinars and coaching calls. After seven months, the program ends with the presentation of a group leadership project.